Prepared by Career Quest Students from their interview experiences. 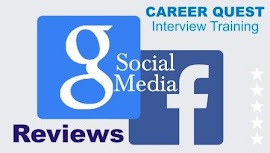 Join Career Quest! No. 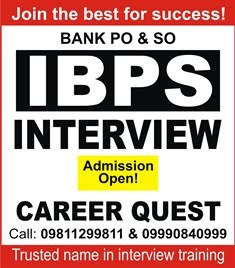 1 coaching institute for interview training in India. 1. Introduce / Describe yourself? 2. What is your father’s name & his job profile? 5. If you will not get success this time then what will you do? 6. About Your Educational background? 7. About Your previous achievements? 8. What is the Job Profile of bank PO? 10. What do you know about banking? 11. What is a Bank? 12. What is Indian Economy? 13. What is Indian Constitution? 14. Why do you want to work in the Banking industry? 15. Why do you want to join Banking sector? 16. What qualities should one possess be a Bank officer? Do you think you have these qualities? 17. Tell me about this organization? 18. Who is the founder of this bank? 19. When was this bank nationalized? 20. Who is your ideal or a person who inspired you most? 21. How will your professional knowledge be helpful in the Banking career? 22. Do you have any plans for further education? 23. Your strong and weak points? 24. As a student of Science/Art/Commerce, why didn’t you go for higher studies? 25. Newspapers and magazine which you prefer to read? Name the Editor of Newspaper? 26. Why should we select you? 27. Why do you want to be an Officer? 28. Any girlfriend? If not then why? 29. What is your idea of life? 30. What is the importance of hobby in our life? 31. What have you done if you face different language situation in future? 32. Why could you not get success yet? 33. Have you been cleared any exam before it? 34. If you don’t get final selection in this examination to what would you do? 35. Why don’t you join your family business? 36. Do you handle pressure well? 37. Do you have any location preferences? 38. Your ideal person, leader, party and why? 39. Does anybody serve in the banking industry from your family? If yes then who they are and in which bank they are serving? 40. Who is the Governor of Reserve Bank of India (RBI)? 41. Why do you want to join banking sector? 42. What are the basics of Monetary policy? 43. What are the functions of RBI? 45. The difference between Check and Draft? 48. What is ‘Green Channel’? 49. Best General Knowledge Books for IBPS Exam. 50. What do you understand by KYC? 51. Any Ideas to improve Banking service? 52. What is Plastic currency? 53. What is an ATM? 54. What is a Debit card & a Credit card? 55. Different types of A/Cs and their features? 56. NABARD and its role. 58. What is a gift card? 60. Does CORE stand for? 61. What is Dubai Crisis? 62. What is the subprime crisis? 63. What is repo rate? 64. What is Reverse Repo? 65. What is Bank rate? 68. What is CBS (Core Banking Solution)? 69. What is ABSA account? 70. What is prime lending rate? 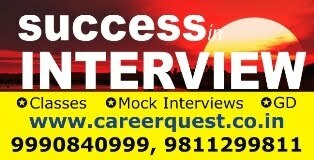 I have joined career quest for IBPS PO interview with lot of apprehensions and confusions about interview But with the help of sanjeev kabeer sir, every thing went absolutely good. I did well at my interview and scored 70/100. The way sir has guided and showed the path was incredible. Everything seemed to be very simple and clear after the interview course. The classes were very beneficial, it helped me to learn a lot about myself . little things like speech, body language and expressions plays a great role in any interview, and sir has beautifully taught us to manage everything. 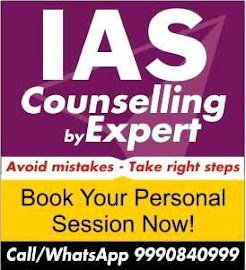 I am highly thankful to Career Quest and Sanjeev sir, for all his efforts and invaluable teaching, which will be very helpful for the rest of the life. 78. CBS, SWIFT, IMPS ,NEFT, RTGS. What are their full forms, features, and benefits? 79. What are main points that make you better banker than people sitting outside? 80. What are the essential products or schemes launched by various banks recently? 81. How is your professional knowledge going to be useful for the bank? 82. What is ATM? And how is it different from White Label ATM? Who are our major competitors and what differences do you notice in our Bankings products? 83. Who is the founder of this bank? 84. As a student of Science/Art/Commerce, why didn’t you go for higher studies? 85. What is your idea of life? 86. What is ‘Green Channel’? 87. Any Ideas to improve Banking service? 88. What is a gift card? 89. What is Call money rate? 90. Why don’t you join your father’s business ? 92. What is CP ? 93. What are various services provided by a commercial bank ? 96. What are Derivatives ? 97. What is Call option and Put option ? 99. What is demonitisation and its impact on Indian economy? 100. How GST will boost economy?